Godsgrave by Jay Kristoff plays the long game. Legit, there’s all these moving pieces and they come together so spectacularly in the end. I should back right up though and say that this is the sequel to Nevernight which I quite enjoyed. So if you’re worried about spoilers and such, maybe look at that review, read Nevernight, and then come back here. 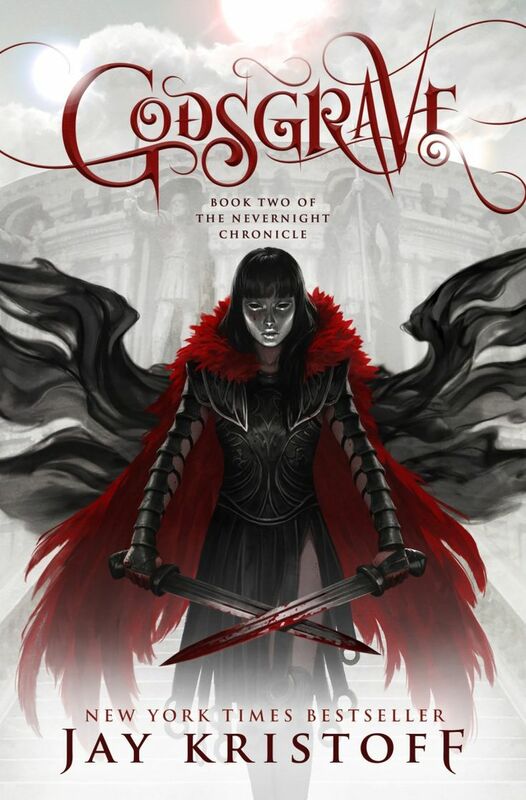 So, Godsgrave basically picks right up where Nevernight leaves off. The Red Church is in dire straits after the attack on it from within. Mia is a Blade because she’s the only option the church has left. She is sent on these different jobs for the Church. Interwoven with these jobs is a separate storyline where Mia is sold to flesh traders and becomes a gladiatii. As a reader, you find yourself questioning how it ended up like this. And so, eventually everything comes together and makes sense. We get to meet another character who is Darkin. There’s plenty of stabbing in this book too – in addition to a few adult scenes. Balance. As expected, Mia Corvere only gets more badass as the books go on. She puts so much on the line in pursuit of vengeance. We get to learn a little bit more about her family. There are some BIG reveals dropped about her parents. Honestly, I can’t wait to see how it all plays out in book three, Darkdawn. I also like that Mia was willing to be a bit vulnerable in this book. She lets herself have friends — reluctantly though. In the end, revenge is important to her, but she finds a way to get that without stepping all over people. I think she finds a way to get her revenge to align with helping out some downtrodden people. Plus, I think with Mia it is like a blindfold is ripped away and she truly sees how awful the Republic is — like beyond what happened to her family. I liked that we got to explore the underbelly of Itreya in Godsgrave. So, the first book Nevernight is basically all set at that Red Church school. I liked that this book really builds the world up and takes us beyond. We get to see this whole world of Gladiatii and just how bad it is. As readers, I think we’re forced to look at the hubris of the Republic and a government that happily enslaves people. It’s just so awful. I am here waiting for Mia to break everyone’s chains and for endgame, whatever that may be, I know it is going to be spectacular. On a final note, there’s a romance in Godsgrave that I absolutely was not expecting. You see, Mia sees an old “friend” from her days at “school.” She doesn’t quite know if she should trust this friend. In fact, she wants to kill her when she first encounters her. However, as it turns out, the girl may have some information Mia didn’t bargain for. Also? They have this wild chemistry between them. I think the romance was written in a way that seems natural. It will be interesting to see how it will all end up. I LOVE when authors are able to put in all these moving pieces and it pays off at the end–sounds like my favorite kind of book. I’ll definitely have to check this out. Great review!